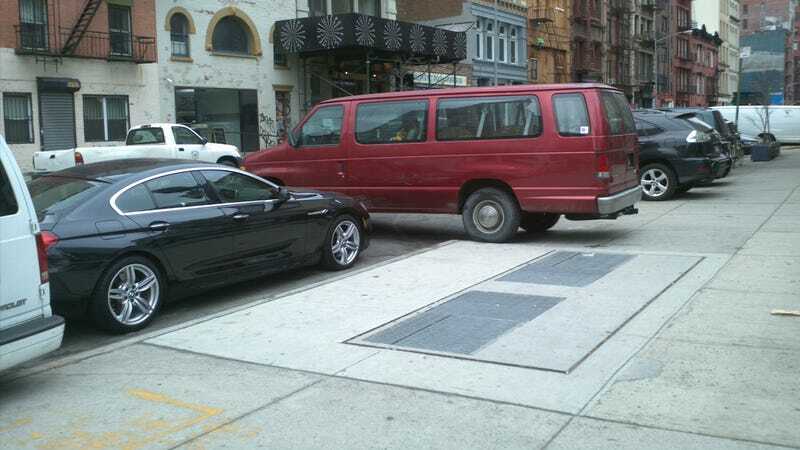 Who Is The Asshat In This New York BMW Parking Job? This is Great Jones Street in Manhattan. On the north side of the street, all the cars always park perpendicular to the curb. Except for this BMW, naturally. Honestly, looking at this picture, it's not clear who is the asshat. Every single car always parks pointing the curb on this side of the street, so the BMW driver is to blame for parallel parking like an idiot and taking up what is basically three spots in his Grand Coupe. On the other hand, he got totally boxed in by at least one of those two vans. Which one, I don't know. I went and checked this parking spot out last night (the picture was sent in yesterday morning) and the BMW was gone. Either the owner miraculously managed to drive out, or somebody carried the car out on a forklift.